It may seem like the helicopter rides are pricey… but most people who’ve been on one will tell you that it’s an adventure not to be missed. Here’s a few tips to make sure you’ll get the most out of your tour. Helicopter tour companies will not fly if the weather is questionable — this is to maximize safety and to ensure that you’ll be able to see all those spectacular locations that you’re flying over. You’re more likely to be able to reschedule your flight if you haven’t waited till your last day on the island. You’ll also want to book at one to two weeks in advance of your trip as popular times fill up fast. You’ll want to make sure your camera’s battery is fully charged and you have an empty memory card in the camera along with a spare or two. It is not unusual to shoot 300 pictures during one trip! Space on helicopters is tight and it can be awkward to change lenses or be messing with batteries so make sure you are organized before you leave the ground. A zoom lens will give you the most flexibility, and you’ll want to set your shutter speed to fairly fast to minimize blur caused by vibration from the rotors. 1/1000 is good and try not to go slower than 1/5oo. You don’t need to worry about depth of field so your lens can be wide open with focus set at infinity. Some photo professionals wear dark clothing or even bring a dark scarf to minimize the glare from the glass window. Another way to minimize reflections is to bring your lens close to the window, but don’t let it touch the window or the vibrations will make your photos blurry. Early to mid-morning is often the best, you’ll have dramatic lighting and often clouds build in the afternoon. 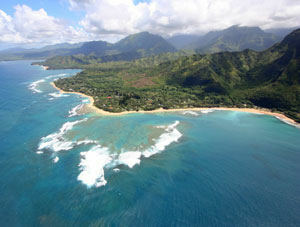 A Blue Hawaiian tour will take you to the Hamakua Coast. Some helicopter tours offer the ability to fly with the doors off. Things get pretty windy and noisy inside the chopper, but you’ll have unobstructed views and no window glare to worry about. Be sure to bring a jacket as it can get quite cold. Don’t let problems with seasickness or airsickness get in the way of this grand adventure — you can minimize your chance of problems by having some ginger chews at the ready. Pop one in your mouth about a half hour before the flight and you’ll feel a lot better when you’re soaring. Be sure to have a disposal bag handy just in case. We recommend booking your Hawaii Activities before you arrive in Hawaii. 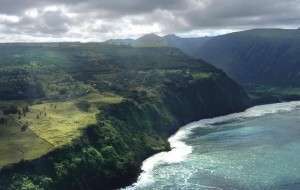 Tropical luaus, round-the-island tours, skin diving, and unique Hawaiian adventures can all be reserved online. You’ll be sure to get tickets on the day you want and likely save money too!